The Vassar Observatory, built specifically to accommodate Maria Mitchell, required first class equipment. Her telescope, made by Henry Fitz and now in the Smithsonian, was the finest available, and since one of the duties of an observatory is to supply and maintain accurate time, the Vassar Observatory also had to have a first class timekeeper. The makers of the Vassar clock were the firm of William Bond and Son of Boston. Founded in 1793 by William Bond, the firm continued with William’s son, William Cranch Bond, (1789-1859), the first director of the Harvard Observatory, and his son, George Phillips Bond (1825-1865), Harvard's second director. The firm imported and made high precision regulators of the finest sort for many years. The high quality, combined with the Bonds' connection to the Harvard Observatory, took the firm to the top of its field. Also, an established friendship between Maria Mitchell’s father and the Bonds meant that the Vassar Observatory could have nothing but a Bond clock. Accordingly, in 1864 Matthew Vassar acquired Bond & Son's Standard clock number 377 for $300 and Bond & Son's chronometer number 323 for $500. The precision of the Bond clocks was a matter not just of the quality of their manufacturing but also of the refinements in their design. Many of these features could be found in products of other manufacturers—and were to be expected of any observatory regulator—and the Vassar clock is an example of the very best work available in its day. The masonry plinths avoid contact with the building's walls and floors. Accuracy starts with stability. Like the Observatory’s telescope, the clock is mounted on its own independent masonry plinth that, allegedly, goes down to bedrock. The building’s floors and walls carefully avoid touching any of these plinths, isolating them from vibration from any external vibrations. 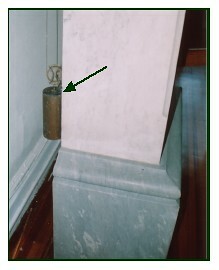 The clock case, made of marble, is similarly extremely heavy and is mounted permanently on the plinth. degree of temperature change. With proper calibration, the rise in the mercury can exactly compensate for any expansion of the rod making the clock run at the same rate winter and summer. Mechanical clocks, that is, non-electric clocks, can be driven either by falling weights or by a spring. But, as anyone who has ever wound a child’s toy knows, springs get harder and harder to wind with each turn of the key. This is true in reverse, too: the power put out by a spring when it’s fully wound is considerably greater than it is when it’s almost unwound. That power difference can change the rate of a clock. Though there are ways of managing it mechanically, running a clock by a falling weight avoids such complications. An additional refinement here that one wouldn’t find in a household clock is that the weight runs outside of the case, in order to eliminate any change in air flow that might arise when the falling weight is near the pendulum bob as it swings back and forth inside the case. The clock's weight runs outside the case. Jewelling, in a watch or clock, is not a matter of aesthetics but of engineering. A clockmaker will put jewels in those places that will receive the most wear. Usually the jewels are in holes in the plates, where they act as stone bushings for the arbors. Very hard, very resistant to wear, a jewelled hole will not become oval in the way a non-jewelled hole will. 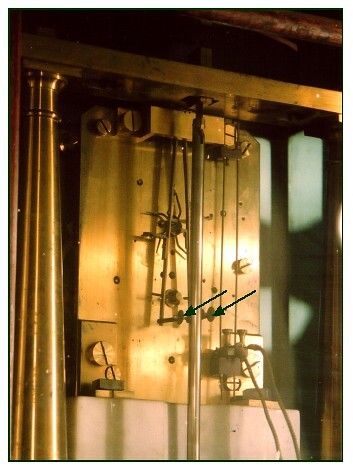 In the Vassar clock the jewels are not in the holes but are thoroughly hidden and thus do their work very discretely. A number of toothed wheels between the weight and the escapement convert the very slow falling of the weight to the speed that the escapement needs to work properly. The numbers of teeth in these wheels are carefully calculated to produce the correct proportions, with the goal of delivering absolutely even, consistent power through the train to the escapement. The same proportions can be achieved using a few teeth or many teeth; very high numbers, as used here, are better, but the power can still vary: a bent tooth, some grit in the train, even the most careful manufacture has its limits. So another mechanical refinement is brought into play with the selection of the type of the escapement. clock uses the highest precision escapement available, the then-recently-developed Denison Gravity escapement. This is an involved and delicate apparatus, difficult and expensive to produce. A clock's pendulum swings because the power of the falling weight, working through the train of wheels and the action of the escapement, regularly delivers a tiny little impulse to it, maintaining its motion. Accuracy demands that the impulse should be exactly the same every time; any change in impulse must be avoided. In 1850 the Denison escapement (named for its inventor Edmund Denison, later Lord Grimthorpe, 1816-1905), was developed specifically for the clock known as Big Ben in London. In this escapement the train doesn’t act directly on the pendulum; rather, with any irregularities the train may have transmitted, it lifts small weighted arms off alternate sides of the pendulum at just a particular moment, and gravity alone, ever unchanging, carries them back down to the pendulum, delivering absolutely consistent impulse. 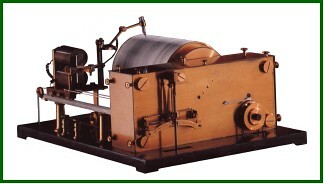 Still in use today, the Denison escapement was the latest development when it was used in the Vassar Observatory clock. Most clocks are designed so that in the train of wheels is one that turns exactly once per hour. The axle—an "arbor" in clock parlance—of that wheel extends through the dial and holds the minute hand, which thus rotates once per hour. Getting the hour hand to rotate once in twelve hours requires another small set of wheels behind the dial called the “motionworks.” In a high-precision clock this additional complication is considered unnecessary and possibly detrimental to accuracy. The preferred alternative is the "astronomical dial" used here, which shows seconds in the small upper dial, minutes on the large dial and hours on the lower dial, without using motionworks. Adjacent to the observatory clock is another masonry plinth that would have originally presumably held a "drum chronograph," such as the one shown here. This one, made or at least retailed by the Bond firm, was an invention of another of the Bond family, William Cranch Bond’s youngest son, Richard. Maria Mitchell’s telescope was originally in the next room, under the dome; it is now in the Smithsonian in Washington. The entire Bond clock shop, where the Vassar clock was presumably made, along with the tools that presumably made it, are also at the Smithsonian. Harvard University has the Bond papers, and their collection of scientific instruments includes the clock that was in the Bond shop window. Vassar is proud and fortunate to still have this clock.